The Castleview Practice, on Stornoway’s Cromwell Street, is being run by dentist Mr Sridhar Kalvakuntla and will provide NHS treatment on the islands. He said: “Opening Castleview is a big responsibility but it is also exciting. “At Castleview our main priority is to keep our patients pain free. We understand the majority of patients can be anxious about dental treatment, and we put all efforts in to providing a stress-free environment in our new practice. “We will be encouraging preventative care for our patients through regular attendance and aim to attend emergencies within 24 hours with daily emergency appointments available. 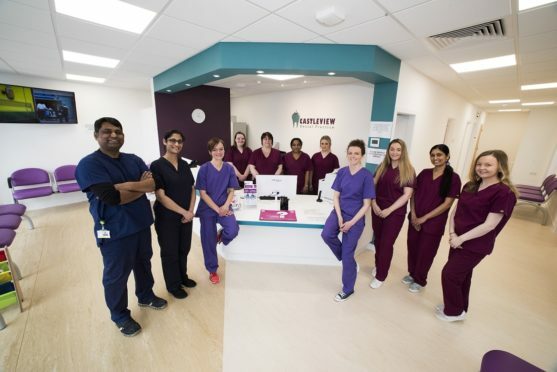 The new practice has a complement of two dentists, a dental therapist, a dental hygienist, six dental nurses and two receptionists. Colin Robertson, NHS Western Isles (NHSWI) chief dental officer, said: “Opening Castleview Dental Practice is a huge act of confidence on Sridhar’s part. “His new practice adds choice, and will reduce waiting times in Lewis. Mr Kalvakuntla began his dental career graduating with a Bachelor of Dental Surgery from Gulbarga University, India, in 1999, before gaining his Diploma in Dental Clinical Sciences in 2005. From 2000 to 2004 he was employed at Vemulawada, in Telangana, South India, before opening his first general dental practice, serving a large population of over 20,000 people. He gained his Diploma in Dental Clinical Sciences from Queen Mary University, London, in 2005, and in 2013 received his licence in dental surgery, from the Faculty of Dental Surgery at the Royal College of Surgeons, London. 2009 to 2016 saw Mr Kalvakuntla work for health trusts in England and in both NHS Dumfries and NHS Grampian in Scotland prior to employment as a locum dentist with NHSWI Dental Centre in Stornoway from October 2016.